West Hills Neighborhood Council stakeholders as well as board members are invited to attend this year’s Budget Day on June 23rd to learn more about how the services we all want and need are financed. There will also be regional break-out sessions later in the morning to discuss local concerns and, if you care about West Hills, your input and involvement is welcome. RSVP below. Free breakfast and parking. 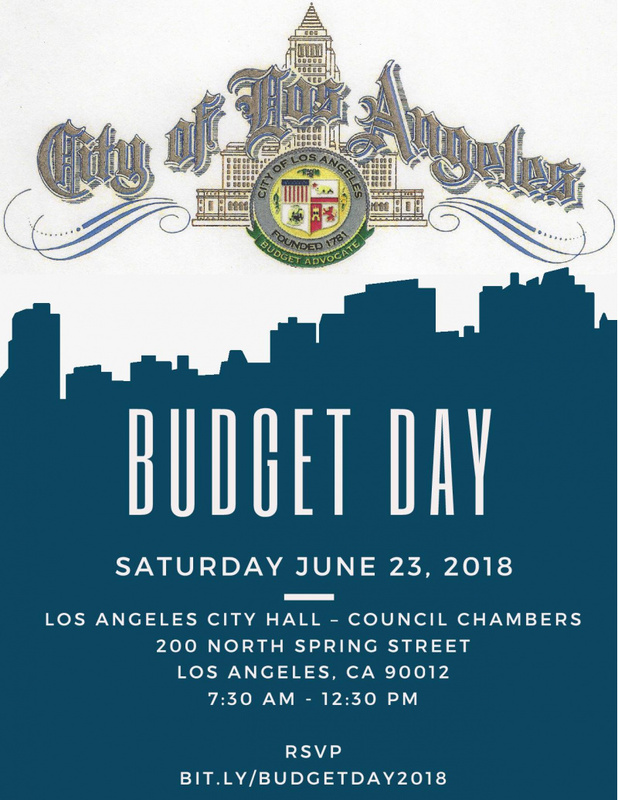 All Los Angeles residents and stakeholders (those people who do business of any kind in the city) are cordially invited to the Budget Advocates’ 2018 Budget Day at City Hall on Saturday, June 23, 2018. Absolutely free, including parking and a chance to see our beautiful City Hall. Starting with a hot and cold buffet breakfast at 7:30 in the City Hall atrium, people will then enter Council Chambers to hear some of Los Angeles’ elected and appointed officials talk about how the City’s budget relates to your life. Check them out; they are a lot more entertaining than you might think from the subject matter. Afterwards, there will be break-out sessions to discuss regional concerns which will wrap up around 12:30. If you have concerns about services or how money is or is not being spent… Come and express your opinions. Once you RSVP you will receive an email with directions to City Hall, how to park and other details. While this event is open to all, the regional meetings will include elections and only Budget Representatives designated by their Neighborhood Council can run and vote. IF you are a duly appointed Budget Rep, to ensure you can vote, please e-mail your name and e-mail address to [email protected] . Photo ID is required, and you will not be allowed to enter City Hall with anything remotely considered a weapon (including small pocket knives). There are no age limits but please respect other attendees’ right to a distraction-free event. Bus, Metro, car, bicycle and by foot. Directions will be sent as access for people and cars differs. City Hall parking requires make, model and license plate of what you will be driving. Bring your laptop or paper and pen if you want to take notes and, more importantly, your concerns and ideas to make Los Angeles a more livable city.